In the last few years, Alabama has been known for excellent offensive linemen. They had two first round choices last year and three in the first four rounds. 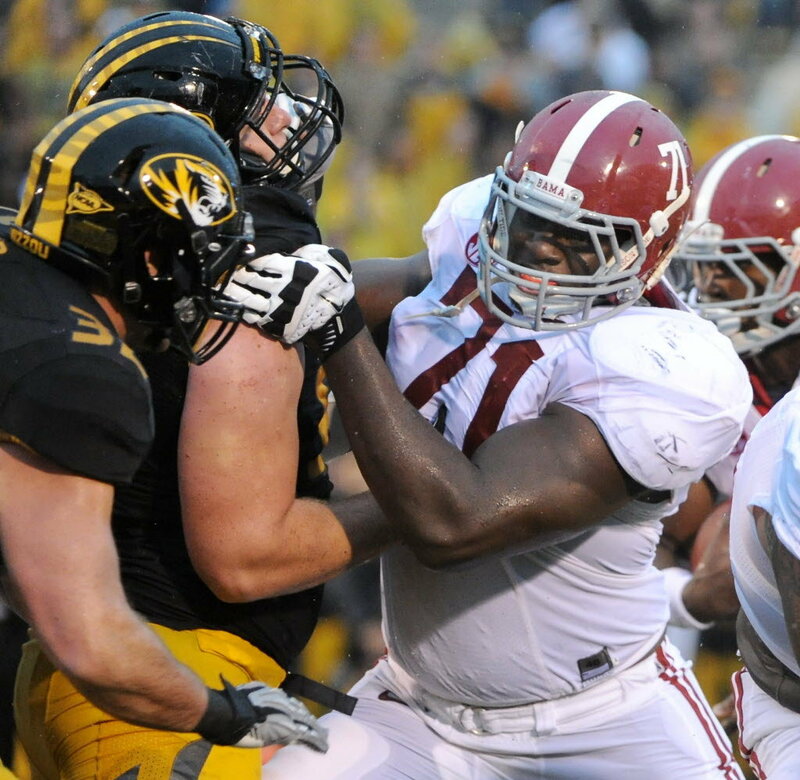 Cyrus Kouandjio is the next in the line of quality offensive linemen from the Crimson Tide. He was instrumental in protecting A.J. McCarron’s blind side and everyone knows how dominant the Alabama running game was last year. Last season was Kouandjio’s first year as a starter and he excelled at the position. He is very talented and is the top player for a very good offensive line class. Kouandjio is massive at 6’6” and 310 pounds and he only has 16% body fat. NFL teams will love his combination of size and athleticism. He is young and still learning, but you can’t deny his strength and power in short-yardage situations and he bends well for someone his size. Kouandjio does a good job in pass protection and can kick defenders out of the play if they gain leverage on passing downs. All in all, I believe Kouandjio has the entire package and the scary thing is he doesn’t even know how good he is. Jake Matthews was part of an outstanding pair of tackles for the Aggies last year. Matthews was the starting right tackle while Luke Joeckel was the left tackle. Joeckel left for the NFL after the season and Matthews will now move to the left side. Matthews has NFL bloodlines. His father Bruce was a Hall of Fame guard for the Houston Oilers and Tennessee Titans and he is now the offensive line coach for the Titans. Matthews should have the athleticism to easily move to the left side. He also has the ability to long snap which will make him even more popular with NFL teams. In 2012, Matthews was a 3rd team All-American and 1st team All-SEC. He has the long arms and quick feet that are needed to protect against speed rushers. Matthews has good balance and very good pass blocking technique. He understands blocking angles and does a good job mirroring the pass rusher. Once he locks onto a defender, they have a hard time separating from him. I believe he will be a top ten selection in the 2014 NFL draft. Taylor Lewan was a 1st team All-American and 1st team All-Big Ten selection in 2012. He is a hard worker that is a strong run blocker. He does a good job handling the bull rush and he battles well, but sometimes gets too grabby. He doesn’t have elite athleticism and quick pass rushers can sometimes give him fits. Lewan is experienced and has been a three year starter for the Wolverines. I’m not sure if Lewan has the quickness and athleticism to play on the left side at the next level, but he should be very good on the right side. James Hurst is starting his third full season as the starter at left tackle for the Tarheels. Going into 2013, he has 36 starts under his belt. Hurst was a 1st team All-ACC selection in 2012 and 2nd team All-ACC in 2011. He is an experienced player that understands pass protection and he adjusts well to schemes used by pass rushers. Hurst has good balance and he keeps his shoulders square. The first game this year will be against South Carolina and all-world pass rusher Jadeveon Clowney. If Hurst plays well against Clowney that will go a long way in improving his draft stock. Antonio “Tiny” Richardson is a massive 6’6” 327 pound left tackle. This will be his second full season as the starting left tackle. He has good athleticism and even took some snaps at fullback as a freshman. Last year, he did a good job against Jadeveon Clowney, only giving up one sack that was late in the game. Richardson was part of an offensive line that only gave up 7 sacks in 2012. He has a very strong upper body and can dominate opposing defensive linemen. Richardson has good movement skills and has the ability to get out in space on screens. He is tough and competitive and is still motivated by the sack he gave up to Clowney. Richardson doesn’t have great balance, but what he lacks in that area; he makes up for with effort and has a mean streak. He has some work to do and probably could benefit with another year at the college level, but you can’t deny his upside. This entry was posted on August 20, 2013 by draftmaniacs in Top 5 at each position and tagged 2014 NFL draft, Aggie football, Alabama football, Antonio Richardson, Cyrus Kouandjio, Jake Matthews, James Hurst, Michigan football, NFL Draft, North Carolina football, Tarheel football, Taylor Lewan, Tennessee football, Texas A&M football, Volunteer football, Wolverine football.